Shields up! We are approaching the sun and will soon be zipping through its corona at 430,000 miles per hour, enduring blistering outside temperatures of up to 2,500 degrees Fahrenheit and risking severe damage from high-intensity radiation… . NASA probe will travel seven times closer to the sun than the previous record-holder. No, this is not a supercaffeinated episode of "Star Trek," in which the gallant crew of the Enterprise yet again put their lives in peril in the name of science. This is real: NASA's Parker Solar Probe mission launched on Sunday, its own 7-year mission to go boldly where no spacecraft has gone before, into the sun's superheated, radiation-rampant corona. Thousands watched as a Delta IV Heavy rocket carried the probe aloft, thundering into the clear, star-studded sky on three pillars of fire that lit up the middle-of-the-night darkness. Not only is the Parker Solar Probe the first spacecraft ever targeted to the sun's close vicinity, it's the first NASA spacecraft named after a living person, solar physicist Eugene Parker. The Parker Solar Probe is part of the Living With a Star program of NASA's Marshall Space Flight Center in Greenbelt, Maryland. 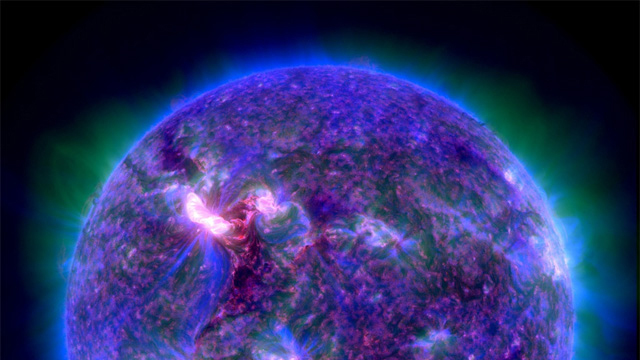 Living With a Star seeks to understand how the radiation and electrically charged plasma the sun blows into space — the solar wind — affects us here on Earth. Key to understanding this sun-Earth connection is comprehending the sun itself — and more specifically, the region of the sun's atmosphere, the corona, where most space weather conditions originate. Until now, missions investigating the sun have either been space-based observatories using telescopes from a distance, or "space weather stations" that measure the conditions of the solar wind as it blows past Earth — or both. This is a little like studying hurricanes on Earth by watching them from above with satellites or measuring the weather conditions on the ground as the storm makes landfall. But to fully understand hurricanes and make accurate predictions of their strength, duration and trajectories across the ocean and land, we need to study the atmospheric conditions that ultimately give birth to these powerful storms. That's where the Parker Solar Probe is different from other solar missions. This spacecraft is being sent to the sun's corona, the headwaters of the solar wind, where it will shine some light on the little-understood processes that stir up space weather. With its suite of scientific instruments, the Parker Solar Probe will investigate the structure and dynamic changes of the sun's powerful and complex magnetic field, count and analyze high-speed electrons, protons and alpha particles (helium nuclei), and capture images of the solar corona and inner heliosphere. By getting an up-close and detailed look at the mechanisms that drive space weather, we will gain a clearer understanding of its interaction with Earth's magnetic field and atmosphere, its potential impacts on satellites orbiting the Earth, and how space weather "storms" that periodically reach us can affect astronauts in space or even people on the ground. In the real world of solar system navigation, the spacecraft will spend a few years maneuvering closer and closer to the sun, making several passes by the planet Venus, using its gravity to alter its orbit. The orbit will be highly elliptical, in a sense ducking in and out of the most radiation-intense regions close to the sun, to minimize time there. 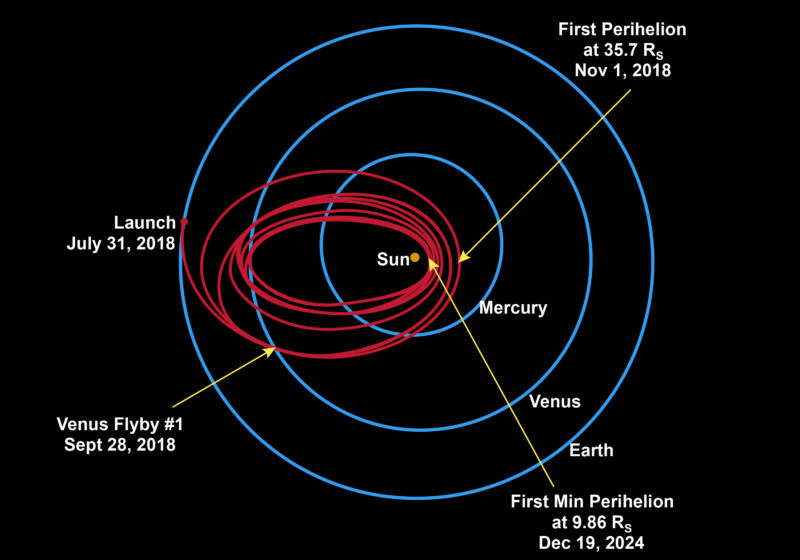 Over the course of its mission the probe will make 24 orbits around the sun, as well as seven close flybys of Venus — and with each pass by Venus its perihelion distance (the point of closest approach to the sun) will grow smaller. 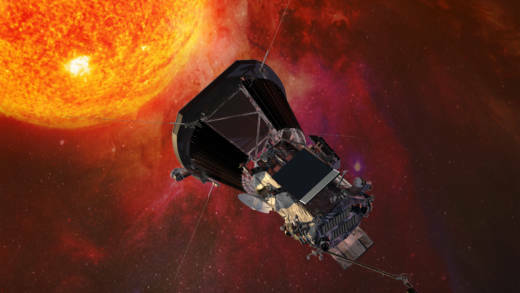 Parker, built and operated by the Applied Physics Lab at Johns Hopkins University, will conduct scientific measurements throughout its 7-year mission, and on Dec. 19, 2024 will make its closest perihelion plunge into the sun's corona, coming within 3.85 million miles of the sun's photosphere (the visible surface we see). That's 10 times closer than the planet Mercury is from the sun, and seven times closer than the previous record-holding spacecraft, Helios 2, in 1976. At this distance, solar radiation is over 500 times more intense than on Earth. 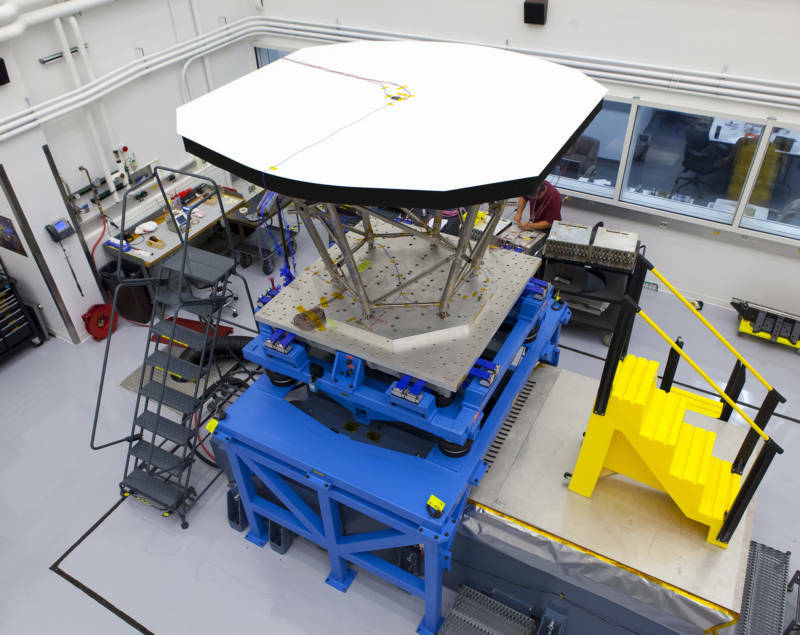 A 2013 "shake test" of the Parker Solar Probe's Thermal Protection System (TPS)--the carbon-fiber shield that will protect it from sunlight 500 times more intense than what shines on Earth. Though the Parker Solar Probe won't have the sci-fi deflector screens of the starship Enterprise, it will be well-protected by the latest thermal insulation technology: a 4.5-inch-thick carbon-composite shield, or "super parasol." During its closest approach to the sun, the spacecraft will retract its main solar power panels behind the shield to protect them from the super-intense sunlight, using a smaller, more robust secondary array to generate electricity. And, with a little luck, it will survive the passage in good health — though maybe a little warmer for the wear.